Why has no-one signed this band? That’s the first thing that springs to mind as you listen to The Dreamside’s new album unveil its many treasures. Because by the time you get to, say, ‘Collide’, the seventh track on ‘Sorrow Bearing Tree’, you can’t help but wonder why no major has picked the band up. Having been on the fringes of a number of labels over the years The Netherlands’ greatest goth metal secret finally lost patience a while ago and decided to go it alone, and in doing so have produced not only the finest CD of their career but also a solid contender for album of the year. ‘Sorrow Bearing Tree’ really is THAT good. Although The Dreamside have been in existence in one form or another since 1993’s ‘Pale Blue Lights’ it’s only really with their 2005 release ‘Spin Moon Magic’ that they began to develop their now recognisable and unique sound and style. Without interference from outsiders they’ve had the time to build on the foundations they laid in 2009 with ‘Lunar Nature’; and the result is an imperious body of fourteen songs, all of which display a disturbing maturity and depth which belie the fact that this is only The Dreamside’s sixth full studio album, a couple of EPs and a stunning collection of remixes (‘The Thirteenth Chapter’) making up the rest of their catalogue. 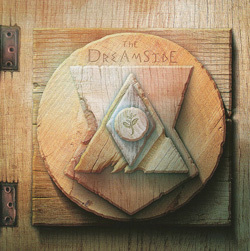 ‘Sorrow Bearing Tree’ is innovative, exciting, and The Dreamside at their best. The closest point of reference comes not from the metal female voices genre but from Halifax, as The Dreamside come at things from a Paradise Lost point of view, albeit with Kemi Vita’s luscious vocals in place of Nick Holmes’ Northern burr. But what the band excel at is capturing and projecting the innate beauty of their compositions, and songs either drive along forcefully or drift like the tide, depending on their disposition. So, while set closer ‘The Spiral Leads’ and the title track, for example, are plaintive elegies of love unrequited, ‘Perfection In Disguise’ and ‘Miracle Days’ throw their heads high and shout loud for all they’re worth. The playing is, as you’d expect, from the top drawer as always, and the production by Ms Vita and bassist Roman Schoensee (the partnership also responsible for writing the bulk of the album) is punchy and entracing. And atop all that comes a dreamy cover of Depeche Mode’s ‘Walking In My Shoes’. What’s not to like?